November 17, 2016 – As Rosetta’s comet approached its most active period last year, the spacecraft spotted carbon dioxide ice – never before seen on a comet – followed by the emergence of two unusually large patches of water ice. The carbon dioxide ice layer covered an area comparable to the size of a soccer field, while the two water ice patches were each larger than an Olympic swimming pool and much larger than any signs of water ice previously spotted at the comet. The three icy layers were all found in the same region, on the comet’s southern hemisphere. A combination of the complex shape of the comet, its elongated path around the Sun and the substantial tilt of its spin, seasons are spread unequally between the two hemispheres of the double-lobed Comet 67P/Churyumov–Gerasimenko. When Rosetta arrived in August 2014, the northern hemisphere was still undergoing its 5.5 year summer, while the southern hemisphere was in winter and much of it was shrouded in darkness. However, shortly before the comet’s closest approach to the Sun in August 2015, the seasons changed and the southern hemisphere experienced a brief but intense summer, exposing this region to sunlight again. In the first half of 2015, as the comet steadily became more active, Rosetta observed water vapor and other gases pouring out of the nucleus, lifting its dusty cover and revealing some of the comet’s icy secrets. In particular, on two occasions in late March 2015, Rosetta’s visible, infrared and thermal imaging spectrometer, VIRTIS, found a very large patch of carbon dioxide ice in the Anhur region, in the comet’s southern hemisphere. This is the first detection of solid carbon dioxide on any comet, although it is not uncommon in the Solar System – it is abundant in the polar caps of Mars, for example. “We know comets contain carbon dioxide, which is one of the most abundant species in cometary atmospheres after water, but it’s extremely difficult to observe it in solid form on the surface,” said Gianrico Filacchione from Italy’s INAF-IAPS Istituto di Astrofisica e Planetologia Spaziali, who led the study. In the comet environment, carbon dioxide freezes at –193ºC, much lower than the temperature where water turns into ice. Above this temperature, it changes directly from a solid to a gas, hampering its detection in ice form on the surface. 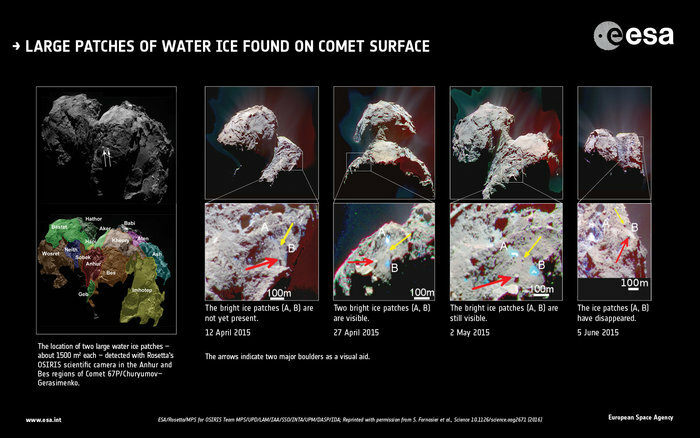 By contrast, water ice has been found at various comets, and Rosetta detected plenty of small patches on several regions. “We hoped to find signs of carbon dioxide ice and had been looking for it for quite a while, but it was definitely a surprise when we finally detected its unmistakable signature,” said Gianrico. The patch, consisting of a few percent of carbon dioxide ice combined with a darker blend of dust and organic material, was observed on two consecutive days in March. This was a lucky catch: when the team looked at that region again around three weeks later, it was gone. Assuming that all of the ice had turned into gas, the scientists estimated that the 80 x 60 m patch contained about 57 kg of carbon dioxide, corresponding to a 9 cm-thick layer. Its presence on the surface is likely an isolated rare case, with the majority of carbon dioxide ice being confined to deeper layers of the nucleus. Gianrico and his collaborators believe the icy patch dates back a few years, when the comet was still in the cold reaches of the outer Solar System and the southern hemisphere was experiencing its long winter. At that time, some of the carbon dioxide still outgassing from the interior of the nucleus condensed on the surface, where it remained frozen for a very long while, and vaporised only as the local temperature finally rose again in April 2015. 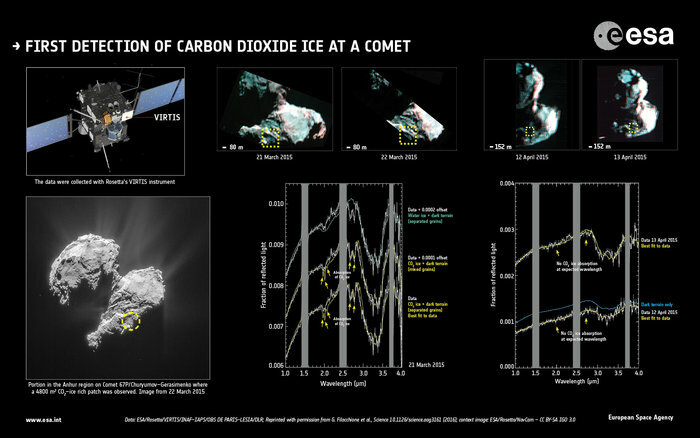 This reveals a seasonal cycle of carbon dioxide ice, which unfolds over the comet’s 6.5 year orbit, as opposed to the daily cycle of water ice, also spotted by VIRTIS shortly after Rosetta’s arrival. Interestingly, shortly after the carbon dioxide ice had disappeared, Rosetta’s OSIRIS narrow-angle camera detected two unusually large patches of water ice in the same area, between the southern regions of Anhur and Bes. “We had already seen many meter-sized patches of exposed water ice in various regions of the comet, but the new detections are much larger, spanning some 30 x 40 m each, and they persisted for about 10 days before they completely disappeared,” said Sonia Fornasier from LESIA–Observatoire de Paris and Université Paris Diderot, France, lead scientist of the study focusing on seasonal and daily surface color variations. 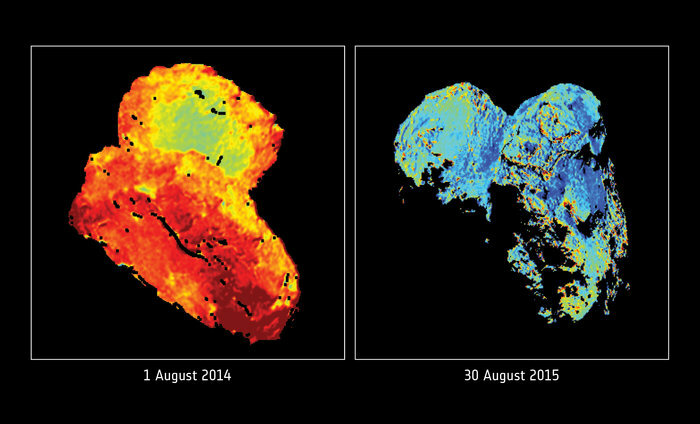 These ice-rich areas appear as very bright portions of the comet surface reflecting light that is bluer in color compared with the redder surroundings. Scientists have experimented with mixtures of dust and water ice to show that, as the concentration of ice in them increases, the reflected light becomes gradually bluer in color, until reaching a point where equal amounts of light are reflected in all colors. The two newly detected patches contain 20–30% of water ice mixed with darker material, forming a layer up to 30 cm thick of solid ice. One of them was likely lurking underneath the carbon dioxide ice sheet revealed by VIRTIS about a month before. “On a global scale, we also found that the entire comet surface turned increasingly bluer in color as it approached the Sun and the intense activity lifted off large amounts of dust, exposing more of the ice-rich terrain underneath,” said Fornasier. As the comet moved away from the Sun, the scientists observed the overall color of the comet surface gradually turning redder again. They also revealed local variations of color, indicative of the daily cycle of water ice. Quickly turning into water vapor when exposed to sunlight during the local daytime, it condensed back into thin layers of frost and ice as the temperature decreases after sunset, only to vaporize again on the following day. The distribution of water ice beneath the dusty surface of the comet seems widely but not uniformly spread, with small patches punctuating the nucleus, appearing and disappearing as a result of the comet’s activity. Occasionally, larger and thicker portions of ice are also uncovered, dating back to a previous approach to the Sun.